The recommendations apply to a newer generation of tank cars — referred to as CPC-1232 cars — in addition to the older DOT-111s that previously were the focus of safety concerns. The recommendations warn that even CPC-1232 tank cars are in need in retrofitting with thermal blankets and adequately sized pressure relief valves capable of performing under fire conditions. That's based on the NTSB's investigation into a Feb. 16 accident in West Virginia involving the derailment of a CSX oil train with 109 of the newer cars. Initially, only two cars ruptured and became fireballs. But the fire spread to another derailed 13 cars when their heated shells failed, according to the NTSB. "Emergency responders reported that the first thermal accident occurred about 25 minutes after the accident,'' the NTSB said. "By about 65 minutes after the accident, at least four thermal failures with energetic fireball eruptions had occurred. The 13th and last thermal failure occurred more than 10 hours after the accident." About 70 percent of crude oil shipped to refineries from the Bakken Shale Formation in North Dakota and Montana, along with 70 percent of ethanol shipped to refineries, is transported by rail, according to the American Fuel and Petrochemical Manufacturers. Most of those freight rail shipments use "unit" trains containing at least 100 tank cars filled with crude oil or ethanol, which has raised safety concerns in communities adjacent to the rail lines being used, including those near the CSX tracks in Rockland County. Monday's announcement comes as the White House Office of Management and Budget conducts a final review of proposed U.S. Transportation Department regulations for tank car safety. Those regulations — expected to be issued by mid-May — likely will harmonize U.S. standards with rules recently announced by Transport Canada. "In light of recent derailments, all options remain on the table," a spokesman for Transportation Secretary Anthony Foxx said Monday. "We have taken a comprehensive approach to crude-by-rail safety that includes prevention, mitigation and emergency preparedness and response." 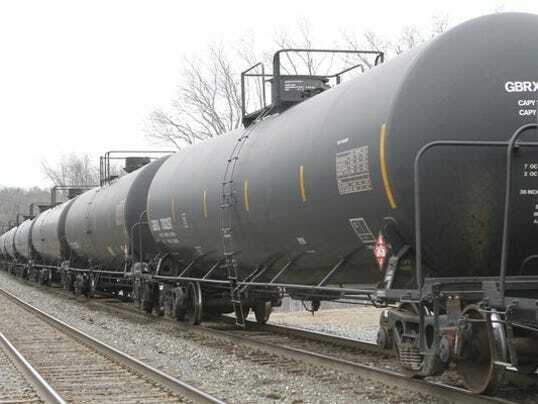 Some congressional lawmakers are urging that, in addition to new tank car regulations, federal officials should require that crude oil transported by rail undergo "stabilization'' to make it less volatile. The regulations nearing their final release include possible speed limits for oil trains and a schedule for quickly phasing out older cars. However, the U.S. and Canada are contemplating allowing the newer CPC-1232 tankers to remain in use for 10 years as the next generation of safer DOT-117 cars are manufactured and put into use. Since the Feb. 16 derailment, three other accidents involving trains carrying crude oil — two in Ontario, Canada, and one near Galena, Ill. — also influenced the NTSB's decision to issue the urgent recommendations. "Preliminary investigation results indicate that a total of 28 CPC-1232 compliant tank cars thermally failed in these four accidents,'' the NTSB said. Tank cars are typically owned by oil or gas companies or by shippers, not by freight railroads operating as common carriers. The American Association of Railroads, which represents the freight railroads, welcomed the recommendations. "The freight rail industry supports an aggressive retrofit or replacement program and believes final regulations on new tank car standards will provide certainty and chart a new course in the safer movement of crude oil by rail," association spokesman Ed Greenberg said.